In this series I want to explore creation phenomena in the American context by sharing the views of others throughout history. To kick it off who better than Ayn Rand, philosopher and writer. Remember the context is economic and not political so stay with me. Ayn came of age during the Russian revolution and its immediate aftermath. What she experienced in those formative years led to a virulent anti communism and anti statism which she describes searingly in ‘We the Living.’ This virulence in my humble opinion was due to her overarching belief in the primacy of the individual. She came to understand it would seem with every single fiber of her being that the animus behind the Soviet state and political systems like it was their opposition to the individual. In fact their modus operandi required his destruction. As we know Ayn escaped and emigrated to the United States where she wrote and founded the Objectivist movement. If Ayn was anything she was a keen observer of the human condition in its relationship to the state. What I find most interesting is that her experience, thinking and philosophy led her to view the United States as the best hope for mankind. Absolutely not perfect but the best hope. 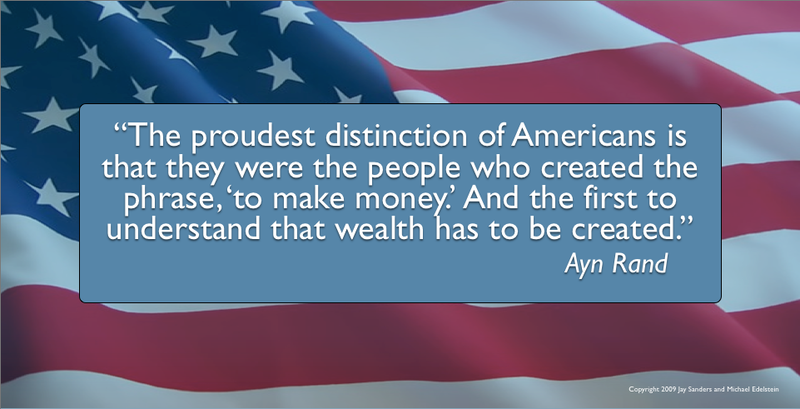 Gallery | This entry was posted in More about Creativity, The American Economic Psyche and tagged American Exceptionalism, Ayn Rand, Creativity, Financial Literacy, Financial Planning, Money, Money Management, Personal Finance, Personal Financial Planning, Retirement Planning. Bookmark the permalink.